Hidden in a small bay, this hotel feels very secluded, private and relaxing. Though town is a bit further away, the beach at the hotel is an amazing place to swim and snorkel with crystal clear water. The Royal Huahine is the most luxurious hotel of Huahine, the “Island of Gardens”. Hidden in a small bay, this resort offers calm and intimacy for the greatest pleasure of honeymooners. It features 18 bungalows in the garden, 11 on the beach and 11 over the water, all facing west to take advantage of the spectacular sunsets over the neighbouring islands of Raiatea and Tahaa. The main building shelters a panoramic restaurant, a bar, a lounge and a boutique. Several activities and excursions are available: scuba diving, land excursions, island tour in outrigger canoe with a picnic, sunset cruises, deep sea fishing. The secluded Royal Huahine is located on the western coast of Huahine, facing the neighboring islands of Raiatea and Taha’a on the horizon. Accessible only by boat from Fare, it has a remote offshore feel although still part of the main island. 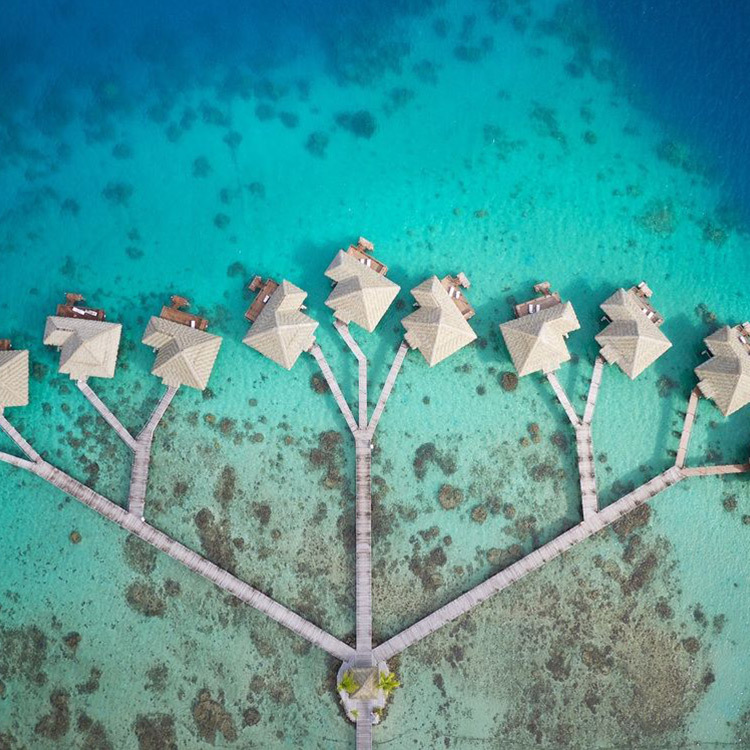 This is the only hotel on Huahine with overwater bungalows, providing an ideal retreat with great snorkeling off your own private deck. Each garden, beach and overwater bungalow at the Royal Huahine features a spacious layout, private patio and traditional Polynesian design. Guest amenities include a freshwater swimming pool, hotel bar, black pearl boutique and a range of free activities. The resort’s overwater restaurant, Le Ari’i, provides a fine dining experience with a spectacular sunset view.